Photo by Eugen Sakhnenko / A-Frame. Photos by Eugen Sakhnenko / A-Frame. Courtesy of Munge Leung. Photo by Eugen Sakhnenko / A-Frame. Courtesy of Munge Leung. 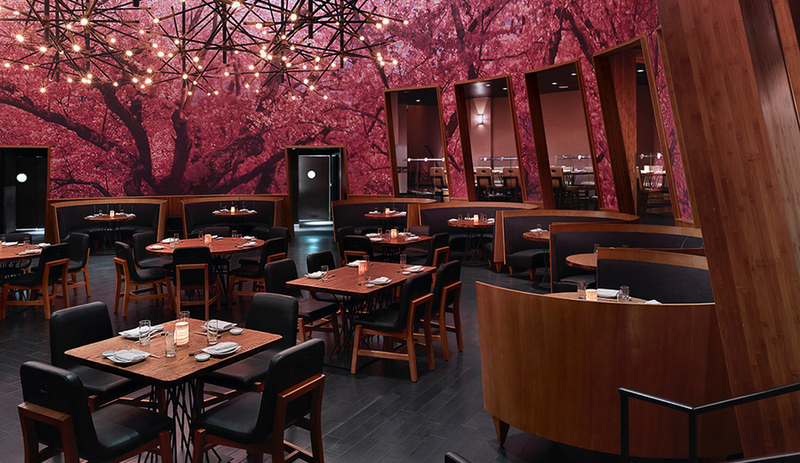 A burst of cherry blossoms – as a graphic motif – makes the intimate dining rotunda the focal point of Kumi, a Japanese restaurant by Toronto firm Munge Leung at the Mandalay Bay luxury hotel and casino. 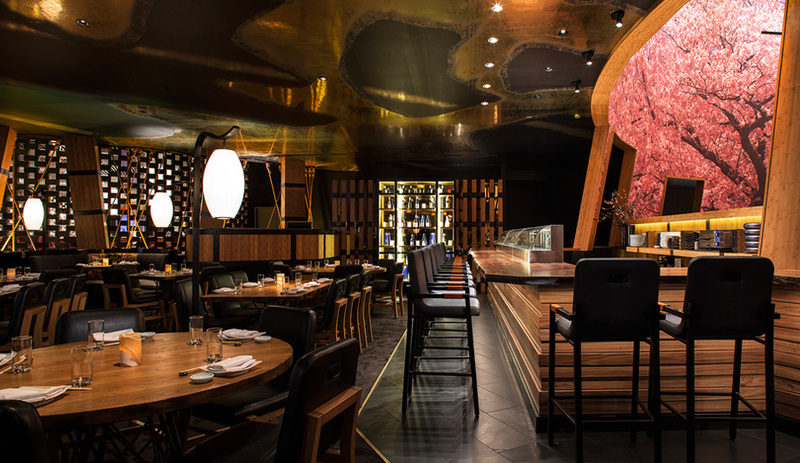 When Andrew Sasson and Andy Masi of The Light Group were ready to add to their roster of Las Vegas restaurants and bars, they turned to Toronto’s Alessandro Munge and Sai Leung. 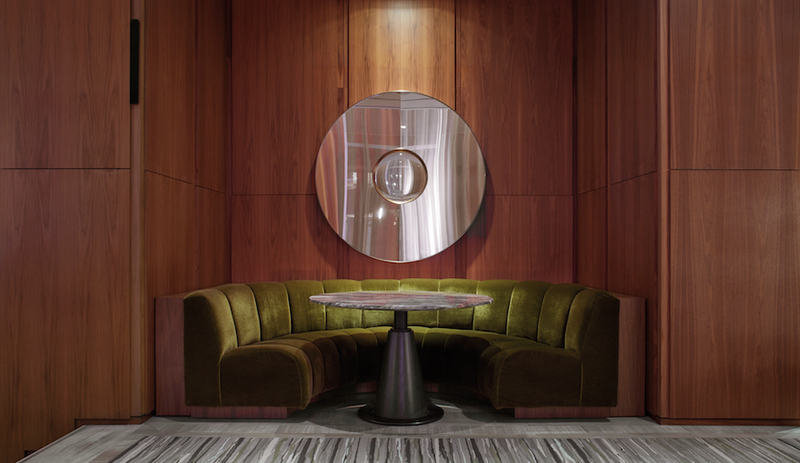 Some years ago, the hospitality impresarios visited Toronto and were impressed with Munge Leung‘s interior for the now-defunct Ultra Supper Club in the city’s trendy Queen West district. 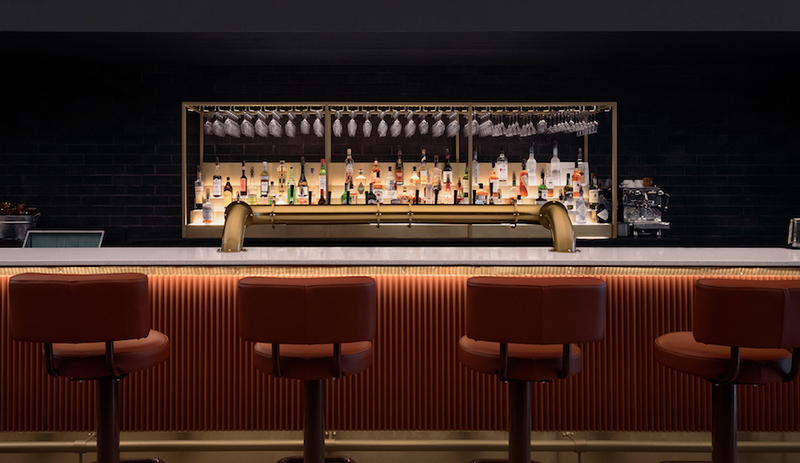 Now, the Toronto studio’s portfolio includes four Light Group properties in Sin City: Mandalay Bay’s striking Kumi Restaurant + Bar and Citizens Kitchen, Bellagio’s classic Lily Bar and Lounge, and Mirage Hotel’s handsome 1 Oak. But Kumi, the darkly glam restaurant, stands apart from the others. 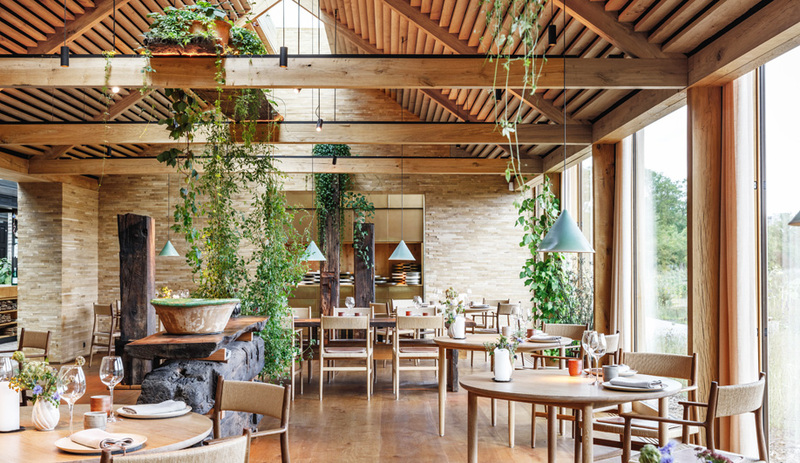 Like the menu – modern Japanese with a Korean-American twist – the interior spins its Japanese influences into modern finishes that steer clear of the kitschy and cliché. 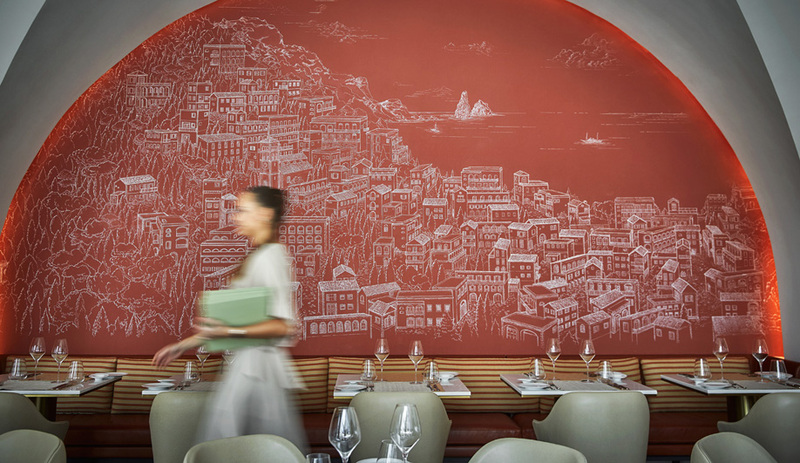 “The bones were good, but we took a tired space and gave it a smart renovation,” says Munge. The firm started by reimagining the rotunda, a previously unpopular enclosed dining area towards the back. “No one wanted to go there, so we created a special place,” says Munge. 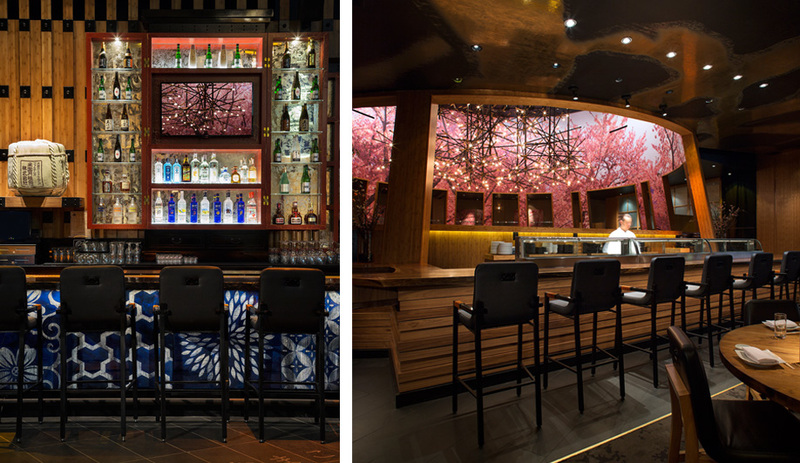 The designers clad the interior in a vibrant wallpaper depicting blooming cherry blossoms (the only overt decorative detail), and installed a bespoke light fixture made of raw pipe and rope. 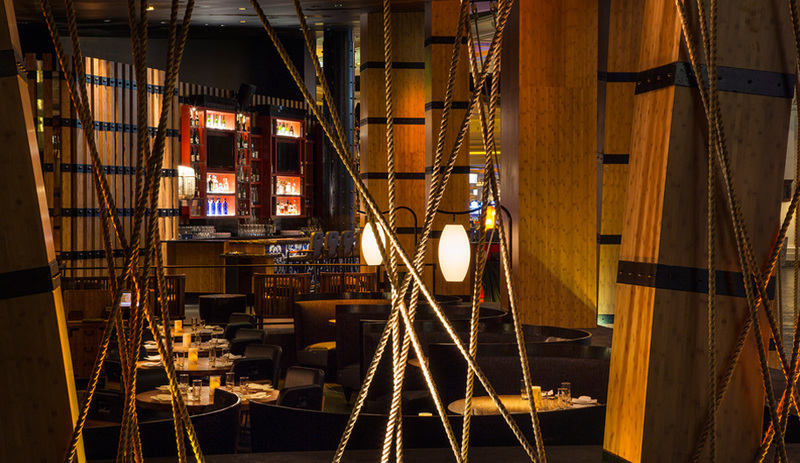 It hangs above diners at tables and semi-circle banquettes like a cluster of samurai swords.